0 Comments Posted by islandtreesadmin in Pet Health on Tuesday, September 20th, 2016. So what can you do to help protect your pets and family? Vaccination is key. 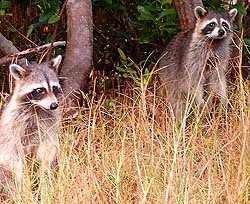 Raccoons are very susceptible to rabies. Stage 1 – Attitude Change: The animal may show nervousness, shyness, aggression or other changes in its normal personality. May show a lack of fear of humans. Stage 2 – Furious or Excitable Phase: Animals may become extremely agitated, or behave erratically. Animals may bite and snap at anything. Wild animals may wander into unaccustomed areas and attack livestock, people or pets. The tone of an animal’s voice may change as its vocal cords become paralyzed. Seizures may occur. Stage 3 – Paralysis: Victims become progressively paralyzed. Animals may be unable to move their hind limbs and unable to swallow, resulting in choking and frothing at the mouth. This phase ends in death, usually from paralysis of the respiratory muscles. Vaccination is an inexpensive, effective means of protecting your animals from rabies. All pets should be vaccinated regularly against rabies. You can minimize the risk of rabies by avoiding close contact with wildlife. Remember, rabid animals often lose their fear of humans and may appear unusually friendly. Ensure that your house is unattractive to wild animals by keeping garbage bins securely fastened and sheds and garages closed. If your domestic animals are bitten or scratched by a wild animal, consult the veterinarians at Island Trees Veterinary Hospital. Vaccination is key to preventing rabies in your pet. If you think you’ve been exposed to rabies, prompt medical attention is essential. If you’ve been bitten by any animal, clean and disinfect the wound thoroughly, then contact your physician or local health authority immediately. If the biting animal can be confined without further danger, it should be kept in a secure area while waiting for public health authorities to arrive. Depending upon the circumstances, the health authorities may choose to quarantine the animal for monitoring, or euthanize it for testing. The animal’s vaccination status influences this decision. Remember – rabies is a fatal disease in humans! Every biting incident should be investigated, even if the animal in question appears healthy. If rabies exposure cannot be ruled out, people who are bitten are usually treated with a series of injections. There is no treatment for animals that have been exposed to rabies. In both humans and animals, the disease is almost always fatal once symptoms of nervous system dysfunction appear. For more information about rabies, contact your local veterinarian or public health official. Prevention is the key to combating rabies. Make sure pets and high-risk livestock are vaccinated properly. Ask the veterinarians and medical team at Island Trees Veterinary Hospital about the best vaccination protocol for your pets or livestock. Keep away from wild animals, no matter how friendly they appear. Keep wild animals away from your home by securely fastening garbage bins and closing garages and sheds.